Looking for an easy detox drink recipe, that will help you to remove toxins from the body, boost energy, and get rid of digestive disturbances like acid reflux, constipation, bloating, gas, etc.? Then try these bentonite clay detox drinks. Bentonite clay is one of the most powerful healing clays, that has been known for its detoxifying properties for many centuries. Many of you for sure have heard about bentonite clay. Bentonite is a very popular healing clay that is used for medical and cosmetic purposes: recently it became quite a popular ingredient for face and hair masks. Also, taken internally, bentonite clay cleanses the body – not only from toxins that piled up in your digestive system and intestines but even from heavy metal toxins, such as mercury, cadmium, lead etc. Bentonite Clay Detox Drinks – what is the secret? Bentonite clay or Montmorillonite is one of the most effective and powerful healing clays. Bentonite clay is made from minerals such as iron, sodium, calcium, potassium, and magnesium, formed from volcanic ash. But in truth, the bentonite clay has a strong negative ionic charge. On the other hand, instances like toxins, the salts of heavy metals residing in our bodies, have a positive ionic charge. When bentonite clay contacts with water, it swells and attracts positively charged ions of harmful substances just like a magnet and then removes them from the body. This negative ionic charge is the reason that bentonite clay benefits are so helpful in detoxifying the body. In addition, bentonite clay affects the human body PH, has an alkalizing effect and supplies human body with several important minerals. Bentonite clay of good quality should have a gray-cream color, closer to white. It should have a very fine grinding, be pleasant to touch. For bentonite clay detox drinks use only odorless and soft clay. If you are going to use bentonite clay internally, always look for a special labeling on the package. Bentonite clay, that is used for external use (e.g. for face masks, mud application and mud baths) is not always purified to the extent that it is safe to be consumed internally. Such clay, in addition to useful substances, can also contain harmful elements, for example, a large amount of aluminum. So, what is the labeling information to look for? Look for the wording “Food Grade Bentonite Clay” on the label or in the name of the product. This gives a sign that Bentonite clay is edible and safe to be used in bentonite clay detox drinks. Which bentonite clay is better for detox drinks – sodium or calcium? There are three main types of bentonite clay: sodium, calcium, magnesium, and potassium. They are identified according to the higher amount of one of these exchangeable ions ie. sodium, calcium, magnesium, potassium. The effect of calcium and sodium bentonite is similar. The main difference between them is that sodium bentonite clay is better suited for cleansing the body because it has a stronger negative negative ionic charge. Therefore, it is more powerful in absorbing toxins. Calcium bentonite, on the other hand, is better for remineralization of your body. But it is absolutely fine to use any (sodium or calcium) bentonite clay for detox drinks. To convert Calcium Bentonite to Sodium Bentonite just add a small amount of salt to a cup of clay and it will have more sodium exchangeable ions and therefore sodium bentonite. Make sure you choose volcanic clay for your bentonite clay detox drinks. It should be clearly stated on the label. There are many other healing clays out there, but it is its volcanic ash origin that makes Bentonite clay so powerful in detoxifying our bodies. Look for pure, clean Bentonite clay with no fillers, binders, additives, or preservatives. A cup or a mason jar. When using a mason jar, make sure not to cover it with metallic lid, as bentonite clay should not come into contact with any metal. Metal spoons and bowls will react with the clay reducing most of its healing properties. Plastic or wooden spoon for measuring and mixing the drink. Bentonite clay is a great ingredient in detox and cleansing drinks. Below you will find 10 easy bentonite clay detox drinks recipes. A quick DIY, what can be easier and faster than mixing by simply adding Bentonite clay it to water. Add half a teaspoon of clay to a glass of water, stir well, and drink straight away before clay sets back to the bottom of the glass. Need something to drink when you’re on the go? One of the simpliest ever bentonite clay detox drinks: add half a teaspoon to a teaspoon to a bottle of water for a nutrient boost. Make sure to give your bottle a good shake before drinking! One of the plagues of our modern society is sluggish, under-active colons. 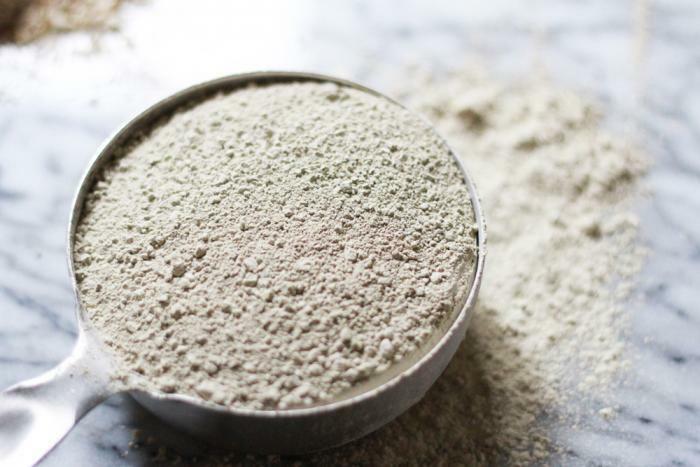 Bentonite clay can also be used as part of a thorough yet gentle intestinal cleanse. The colon cleanse has been used throughout history to improve the body’s natural detoxification processes and restore digestive health. A combination of fiber supplements and bentonite clay may support detoxification and promote weight loss. One of the best fiber supplements for colon cleanse is Psyllium husk. Psyllium husk powder and Bentonite clay, when mixed with water, swell up, creating a slippery, gelatin-like substance. Drink the mixture following a large amount of water. Requiring several ingredients – bentonite clay, activated charcoal, psyllium husks, cayenne pepper, and chia seeds – this Colon Cleanse provides the strong detoxifying effect. Pay attention, that you need to drink additional 16 glass of water after taking this colon cleanse in order to prevent dehydration. Yummy smoothie with kale, cucumber, orange, pineapple, stevia and of course a teaspoon of bentonite clay! A great way to enjoy the fresh taste of fruits and greens while detoxifying your body! Fresh, filling smoothie, one of the most filling bentonite clay detox drinks. Perfect for spring cleanse. Gives an energy boost due to lemon and ginger notes. Recommended bentonite clay to use is Redmond Bentonite Clay. This clay is unique in that it’s both sodium and calcium bentonite. Redmond Clay is quite alkaline and has proven effective in neutralizing heartburn, reflux, and upset stomachs. Give it a try next time you are heading to the kitchen to make yourself a smoothie. Mixing bentonite clay and essential oils? That sounds unusual. But give it a try and you will love this detox drink recipe. Paired with pungent ginger and the punchiness of citrus, you get a refreshing, stomach-soothing smoothie. Make sure to use only food-grade essential oils for this recipe, as consuming essential oils, that are not approved for internal use, can be dangerous. This is one of my favorite bentonite clay detox drinks. Low on calories, detoxifying and helping with weight loss – what else is to desire. The mixture of strawberry, pomegranate and lemon juice reduces inflammation and prevents oxidative stress. Add bentonite clay to the mixture and turn it into a powerful detox drink. Do not want to bother with measuring and mixing bentonite with water or fruits? Try this ready liquid bentonite mixture. You’ll love this detox cleanse – it detoxifies and energizes your body while promoting weight loss. It is also a great liver detox because it has a powerful 37-1 toxin removal ratio. The mixture contains pure bentonite clay and filtered spring water. It is tasteless so no need to mix it with other ingredients, like juices or fruits. Another great liquid bentonite clay detox drink. Provides alimentary detoxification – binds herbicides and other potentially harmful substances by adsorbent action. The total absorptive surface area of each tablespoon serving of Great Plains Bentonite is over 900 square yards. Helps to fight candida, gut dysbiosis, mold, infections, ammonia, allergies. Take 2 tablespoons (one in the morning and one in the evening) per day. And don’t forget to drink plenty of water to help bentonite clay to eliminate toxins from your body. Apple Cider Vinegar is alkalizing, which balances out the pH levels of the body. Both spirulina and bentonite clay offer unique anti-radiation properties. Bentonite clay absorbs toxins. Find a detox drink that works best for you. For different effects, you can alternate between water shakes, smoothies and colon cleanse. As always, stay safe and consult with your healthcare professional in case of any concerns. Thanks for sharing, I love usng bentonite clay on my skin and it always leave my skin feeling fresh and as good as new.